In 1970, the Sinn Féin party experienced its biggest split in fifty years. The ongoing failure of their armed campaign to reassert the 1916 Irish Republic had led many within the party to consider a different approach towards attaining their goal. This new approach was a Marxist one which sought to eliminate the class differences which existed in Irish society, particularly the conflicts between the Catholic and Protestant working classes in Northern Ireland. The guerilla tactics of the IRA would be abandoned in favour of this approach, which also called for an end to abstentionism. While many in the leadership favoured these changes, considerable resistance emerged ahead of a party conference to vote on the matter in 1970. The conference resulted in a defeat for the leadership, which needed two-thirds of the party to support the changes for them to be effected. Those who opposed the changes staged a walk-out and became known as "Provisional" Sinn Féin, with the remaining members calling themselves "Official" Sinn Féin and adopting the new measures which had caused the split. Both factions had similarly-termed sections of the old IRA behind them. "Official" Sinn Féin contested the 1973 general election with 10 candidates, four of them in Dublin. None of these candidates were elected, nor did any of them receive anything above 9% of the vote. The party contested the next general election four years later, under a new banner which reflected their change in emphasis - Sinn Féin: the Workers' Party. 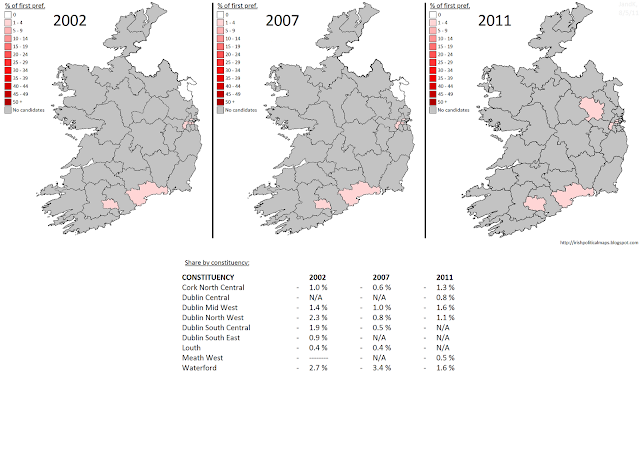 The party ran 15 candidates this time, and while they once again failed to win a seat, their vote was beginning to strengthen in certain parts: candidates in Waterford and Cork North East gained approximately 10% of the vote each. The results in other constituencies were not as impressive, however. This was the election which saw the "Tullymander" - the redrawing of constituency boundaries by the incumbent Fine Gael-Labour coalition in order to ensure its re-election. 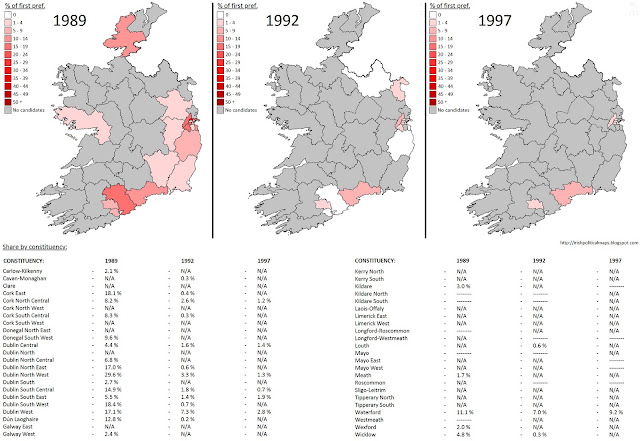 The drastic re-organisation of boundaries - particularly in Dublin - made it very difficult for a new and minor parties to solidify their support. The boundaries were altered yet again for the 1981 election, but this was done by an independent commission and would be the last reorganisation to be so extreme in its scope. 1981 saw success for the party: Joe Sherlock won election to be the party's first TD, representing the new Cork East constituency. He won 14.5% of the vote, further increasing his share from the last time. Sinn Féin: the Workers' Party also fought the next two elections which occurred in the following year. 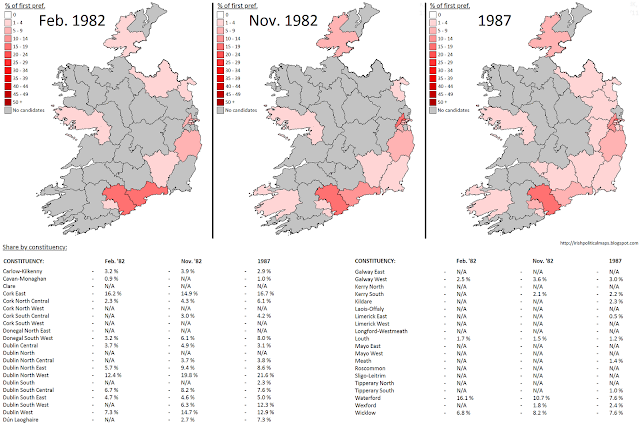 The February 1982 election saw the party's fortunes increase as they won two extra seats: Patrick Gallagher in Waterford and Prionsias de Rossa in Dublin North West. In April the party voted to drop the "Sinn Féin" title and became simply "The Workers' Party". Another election in November saw the party's first losses, as Joe Sherlock and Patrick Gallagher were not returned. De Rossa held his seat and was joined by party leader Tomás Mac Giolla in Dublin West. From 1979 the party contested elections in Northern Ireland, but did not prove as successful there as it did in the Republic. Despite the loss in 1982, the party's vote was strengthening nationally, and more candidates were being fielded with each election. Like the Labour Party, the Workers' Party found much of their support coming from Dublin and the south east. The 1987 general election saw gains once again: Sherlock regained his seat and a new TD, Pat McCartan, was elected in Dublin North East. 1989 saw the Workers' Party reach its peak. Prionsias de Rossa was elected MEP for Dublin in that year's European parliament election, while the party gained three seats in the Dáil to return a total of 7. Amongst the new TDs was future Labour Party leader Eamon Gilmore, representing Dún Laoghaire. Less candidates were put forward in this election, as the party had found where its main base lay and appeared to stay and build in those areas. The opportunity to do so would not last for long. Against the backdrop of the collapse of the Soviet Union and the fall of communism in Eastern Europe, many within the Workers' Party had become concerned that their Marxist approach could result in their own decline in future elections. These members were also concerned about the possible activities of the "Official" IRA, which theys wished to purge from the party constitution. In an interesting parallel to 1970, their measures failed to secure a majority at a party conference in 1992 and a new split occurred. The reformists, led by Prionsias de Rossa, formed a new party called Democratic Left. This new party contained all but one of the Workers' Party TDs (Tomás Mac Giolla). Both factions contested the 1992 general election, but with the majority of the party's strongest personalities now in Democratic Left, the Workers' Party returned its worst result yet. Mac Giolla lost his seat and the party was without representation in Dáil Éireann. Their share of the vote collapsed to 0.7% (it had been 4.9% in 1989). The party was in no better shape by the time of the next election in 1997, running a diminished total of 7 candidates. Again, no seats were won. The success the Workers' Party had enjoyed in 1989 was continued by Democratic Left. 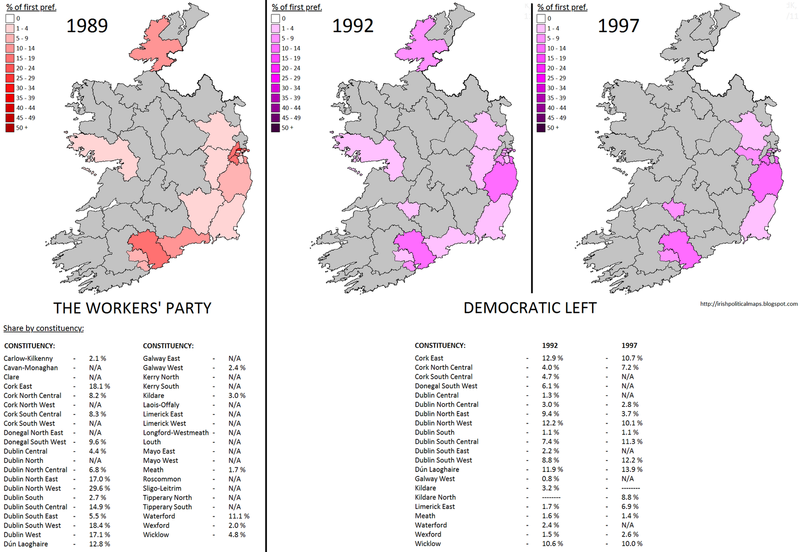 The new party won 4 seats in the 1992 election. Prionsias de Rossa returned as a TD and was replaced in Brussels by party member Des Geraghty. Further success came in 1994 with victories in two by-elections, though Geraghty lost his seat that year to Patricia McKenna of the Green Party. Also in 1994 the party entered government for the first time. Their partnership with Labour and Fine Gael saw the new government dubbed the "Rainbow Coalition". De Rossa held Democratic Left's sole portfolio, Social Welfare. In 1997 the Rainbow Coalition fought for re-election, but a backlash against Labour prevented them from securing a combined majority. Democratic Left's four incumbent TDs held their seats, there were no gains or losses. The party would sit in Opposition for two years before an agreement was reached between them and the Labour Party to merge. Both of the Labour Party leaders since 2002 - Pat Rabbitte and Eamon Gilmore - were members of Democratic Left prior to the merge. To illustrate how much support Democratic Left took from the Workers' Party in the 1992 split, the WP's 1989 votes are shown again below alongside Democratic Left's shares in the next two elections. Since 1997, the Workers' Party has enjoyed its only successes at local level. In 2002 they won a mere total of 4,012 votes nationally, a number which dropped by about a thousand by the next general election five years later. The 2011 general election, which saw a boon for most left-wing parties, saw no change for the Workers' Party, which ran only 6 candidates. 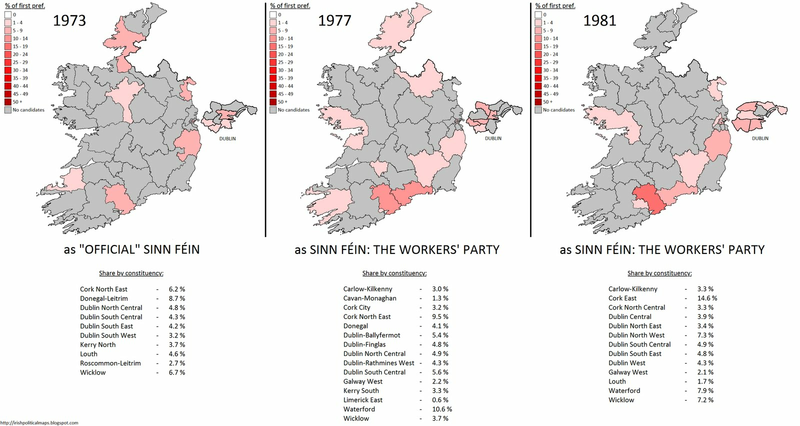 The majority of the left-wing vote went towards the United Left Alliance group, which the Workers' Party did not partake in, and the other faction of the 1970 split, Sinn Féin. Just 22 years from their peak, the Workers' Party's future in national politics is a bleak one. On the one hand the departure of their best and brightest in 1992 was never going to be easy for the party to recover from. On the other hand, Democratic Left's assertion that Marxist parties would decline post-1991 may have, in a small way, been prophetic. The Workers' Party prospects for the next scheduled elections - the 2014 local elections - depend on how the left-wing vote develops in Ireland over the next few years.